Netflix may be growing around the world, but it failed to meet its own hype here at home. The streaming service reported that it had added 880,000 subscribers in the U.S., far short of the anticipated 1.15 million increase. It was also fewer than the 980,000 boost in U.S. subscribers that Netflix recorded in the third quarter last year. Netflix (NFLX) stock was down 6% in after hours trading. Overall, Netflix surpassed 69 million subscribers and exceeded its expectations in overseas markets with 2.74 million internationally. Netflix said the sluggish U.S. growth "was driven in part by the ongoing transition to chip-based credit and debit cards," creating an "inability to collect." There's no doubt about it: Netflix is finding it harder to grow in the United States since tens of millions of homes already have subscriptions. Netflix is forecasting an additional 1.65 million new subscribers in the U.S. in the fourth quarter of the year, when the holiday season spurs sales of new TV sets and mobile devices, but in the fourth quarter last year it gained 1.90 million subscribers. Netflix sought to temper investors' concerns in its quarterly shareholder letter, however, by saying that "we expect to finish 2015 at about 2014 levels," calling it the "fourth consecutive year we've added about 6 million members in the U.S."
Raising the subscription price is another way for Netflix to show growth. The company noted that it hiked its prices in Europe in August "without negatively impacting growth." It explained last week's announced price hike in the U.S. by saying it'll "improve our ability to acquire and offer high quality content, which is the number one member request." In a video-conference session Wednesday, chief content officer Ted Sarandos indicated that Netflix may be interested expanding into news programming. During the call Netflix CEO Reed Hastings asked Sarandos, "What is the likelihood we compete directly with Vice in the next two years?" Vice Media has become known for its video news programs and is planning to launch a daily news show. 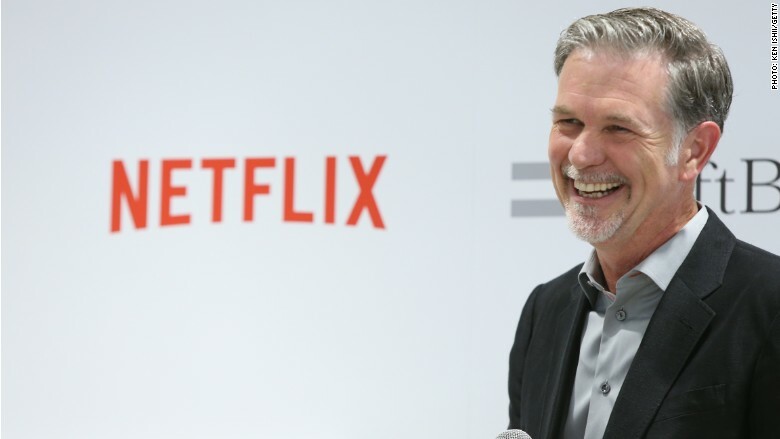 Netflix had plenty to be happy about in its third quarter, which was marked by well-received content on its platform and praise from the television industry. The streaming TV service picked up 34 nominations at this year's Primetime Emmy Awards. It only won one big award, however, for "Orange Is the New Black's" Uzo Aduba in the Outstanding Supporting Actress in a Drama Series category. The company is now setting its sights on motion pictures: it is premiering its film, "Beasts of No Nation," in theaters on Friday. The film will be distributed in both theaters and on Netflix simultaneously. It holds a 91% score on review site Rotten Tomatoes and is catching Oscar buzz for its star Idris Elba. "Idris Elba gives a powerhouse performance," wrote Rolling Stone movie critic Peter Travers. "The Oscar for Best Supporting Actor should have his name on it." Netflix also looks to have a happy holiday with its first Christmas special, "A Very Murray Christmas." The special, which the company released the trailer for on Wednesday, stars Bill Murray as he attempts to hold a Christmas celebration during a snowstorm.